With their infectious, rollicking country swing and their charisma hearkening back to the golden era of the silver screen cowgirl, the Sweetback Sisters are guaranteed to charm the boots off of one and all in their Freight debut. The Sisters' whimsical, Kitty Wells-inspired stage demeanor comes firmly wrapped around a core of solid musical chops, a deeply felt love for traditional country music styles, and a joy in playing together that is palpable. 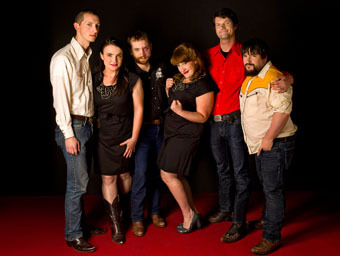 Spotlighting numbers from their new CD, Looking for a Fight, the Sisters mix country classics and a handful of new songs, all topped with a healthy dash of irreverence and freewheeling enthusiasm. The group features Zara Bode and Emily Miller—that's them out front with the matching dresses and seamless harmonies—with drummer Stefan Amidon, electric guitarist Ryan Hommel, guitarist and fiddler Jesse Milnes, and Peter Bitenc on bass.